Jo Mynard, Kanda University of International Studies, Japan. The current issue contains five diverse papers from colleagues based in Japan, Pakistan and New Zealand. The contributions examine self access through the lenses of extensive reading, advising, study abroad, and online environments. The first paper by Shinobu Nakamura from Musashi University in Japan examines the implementation of an extensive reading class in terms of effects on students’ reading and listening skills. The study reveals some insights into aspects of extended reading program such as intensity, frequency and duration. The second paper describes a study conducted by Toshinori Yasuda from Waseda University in Japan regarding ways to deal with trait anxiety and perfectionism. Drawing on theory and practice, the author suggests some practical skills for advisors who do not have a background in psychological counselling. Ayesha Perveen from the Virtual University of Pakistan explores the role of Massive Open Online Courses (MOOCs) in professional development (PD). The author suggests that MOOCs have potential benefits for ongoing teacher PD in terms of language development and teaching skills and knowledge. Melissa Huntley Omuro from the University of Shimane in Japan investigates language maintenance in Japanese study abroad alumni. In this exploratory study, the author discovered that students used digital tools and focused mainly on language input. This suggests a preference for technology-based, passive foreign language tools. In the final paper Qunyan Maggie Zhong from Unitec, Institute of Technology in New Zealand provides a single case study showing how a learner’s autonomy evolved in online environments while focussing on his learning needs and goals. As ever, I am grateful to members of the review and editorial boards for their help with producing this issue and to the authors for choosing to publish with us. 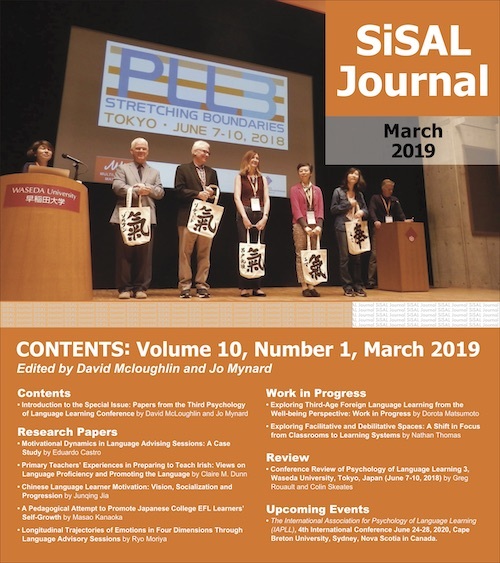 Jo Mynard is the founding editor of SiSAL Journal. She is a professor and the Director of the Self-Access Learning Center at Kanda University of International Studies in Chiba, Japan.